As a fast SUV, the Cupra Ateca is sort of out on its own. Until alternatives spring up, it’s the fastest crossover this side of a luxury product. Calling the Ateca a cut-price version of the Porsche Macan may not sound like a compliment, but the entry-level Macan is considerably more expensive – not to mention slower and less powerful. Auto Express journalist Steve Sutcliffe, who recently took a Bullitt Mustang around the Isle of Man, has reviewed Cupra’s first standalone product. Scroll down for the video. His first impressions are that it’s a good-looking car, and that it feels like a hot hatch – in other words, properly sporty. The Cupra badges, body kit and 19” two-tone alloy wheels complement the SEAT Ateca’s stylish design without overpowering it. It’s sporty and relatively subtle at the same time. The seating position is lower than the SEAT to improve the driving experience, but still a bit taller than the Leon – giving you a commanding view out over the road ahead. From the Cupra-branded sports seats, Sutcliffe has control of all the car’s functions. And there are plenty of them, as he marvels at the standard kit list on offer, which includes large configurable digital dials, a full suite of driving modes and a top-view camera, to make parking a breeze. Put the Ateca into one of the softer driving modes and it settles down to become a comfortable and easy companion for long drives and day-to-day life. However, press that Cupra button and 300hp is ready to be deployed. The tasty performance comes from a turbocharged 2.0-litre engine, and is marshalled by SEAT’s excellent seven-speed DCT automatic gearbox and permanent four-wheel-drive. Sutcliffe particularly praises the gearbox, accurate steering, optional Brembo brakes (which come as part of the Sport Pack) and the amount of grip available. You might notice the extra height and weight compared to a Leon – as the video points out – so there are occasions where it won’t feel as crisp as a sports car. 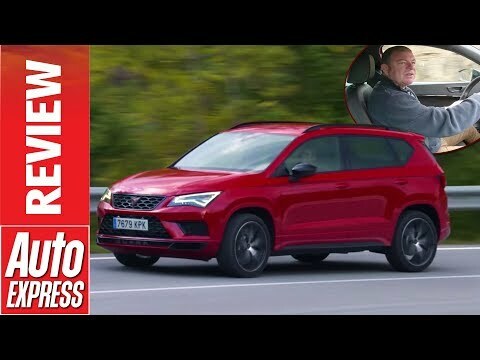 But if you are interested in a Cupra Ateca, you are probably unlikely to want to take it to a racetrack. Equally, Sutcliffe suggests it should make more noise, but most of the time this car will be used for day-to-day driving, where you won’t always want a loud car. You will appreciate the practicality, though. The large boot and spacious rear seats will come in handy for family duties or carrying lots of luggage. Plus, it’s still a SEAT underneath so it’s still really well built. Overall, Sutcliffe finds it to be a quality car that has a well-rounded mix of attributes. The Cupra Ateca SUV is available to order from your local Hartwell SEAT garage now. Here's your latest look at the upcoming SEAT Leon, which has been heavily disguised while it's in development. Read all the latest details here.